The leash stays out of the way and out of your peripheral vision. I started making lanyards a few years ago for myself and as gifts for a few friends. 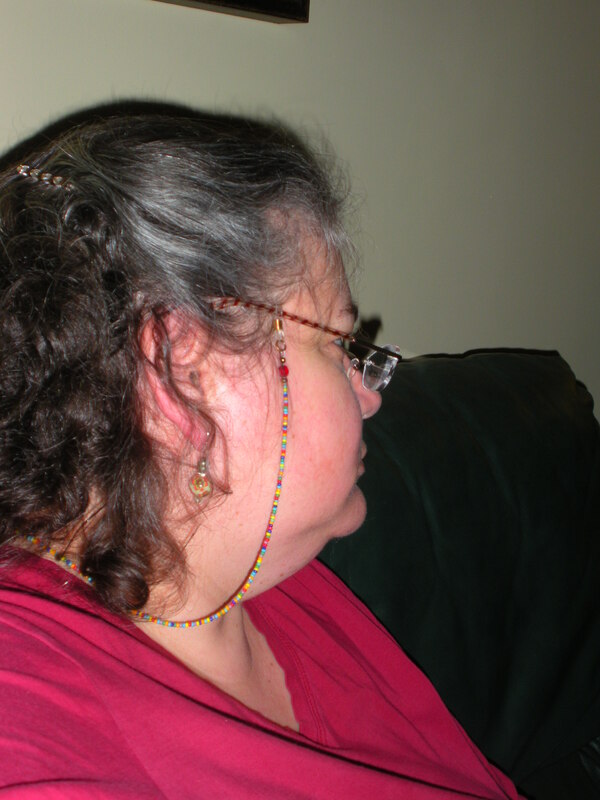 Then, when I hit my mid-40’s, I gave in to the inevitable and joined the rest of my book group in needing reading glasses. The funny thing about “readers” (or “cheaters” as some people refer to them) is that you don’t need them all the time, so I was continually setting them down and then searching for them again a few minutes later. 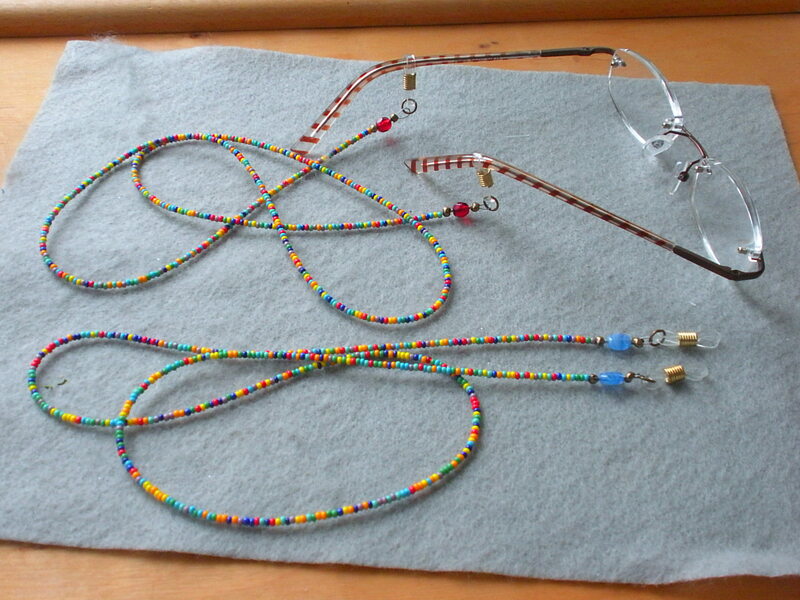 Beaded eyeglass leashes solve the problem of misplaced glasses and allow the wearer to keep those “cheaters” handy with a personalized style. 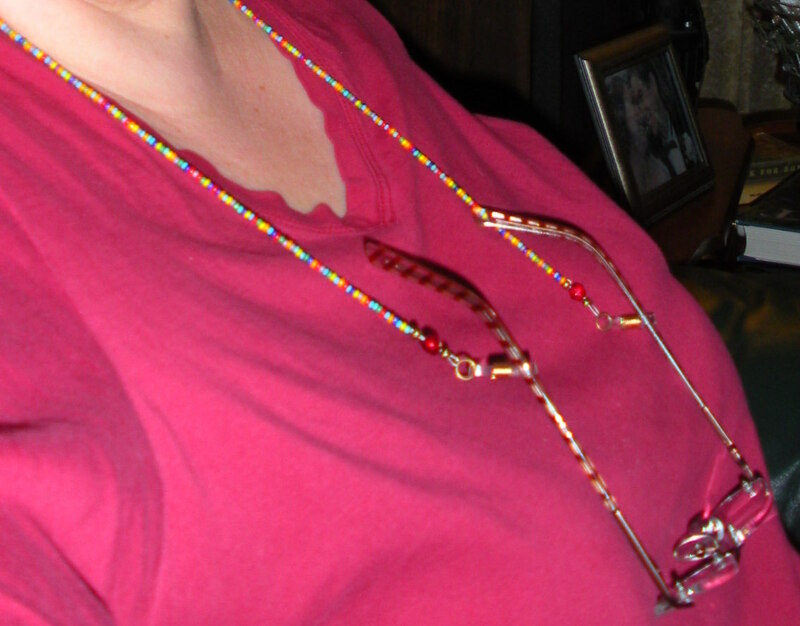 *These single strand, lightweight eyeglass leashes have 10/0 multicolored glass seed beads with a single color-coordinated bead on each end, separating the crimp beads. 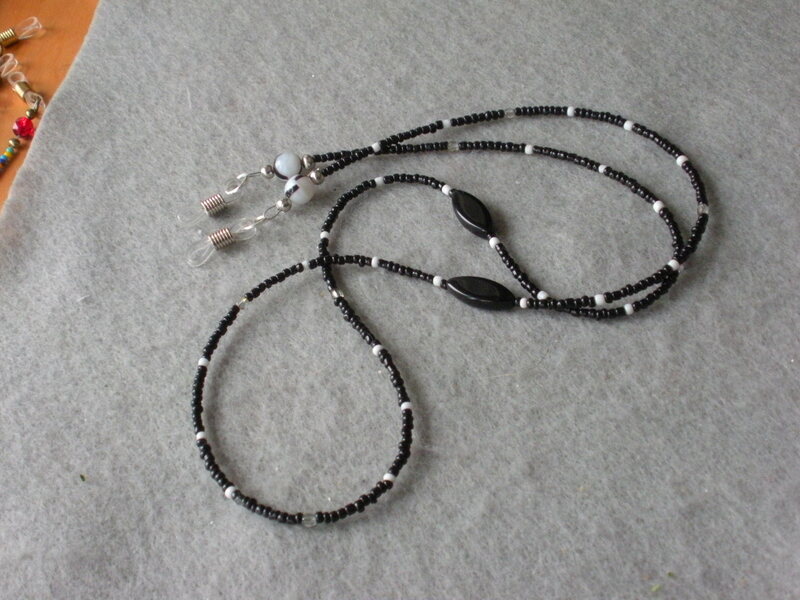 Each bead strand is double-crimped with crimp bead covers, measures approximately 28 inches in length and comes with clear adjustable rubber end pieces. 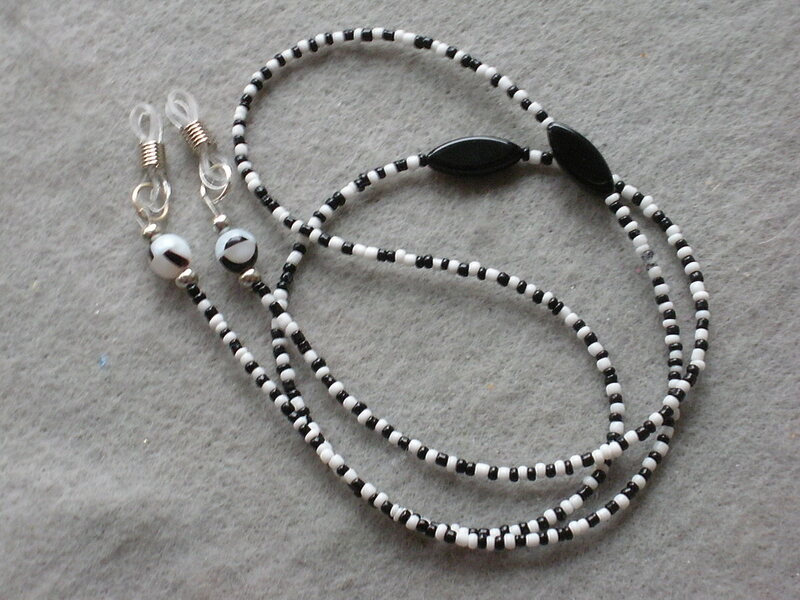 These next two examples were made-to-order for someone who asked for something simple in black and white and a second one much like the first only mostly black. All of the eyeglass leashes shown above are very lightweight and simple in style, with clear/silver or clear/gold adjustable rubber end pieces (depending upon the color scheme). 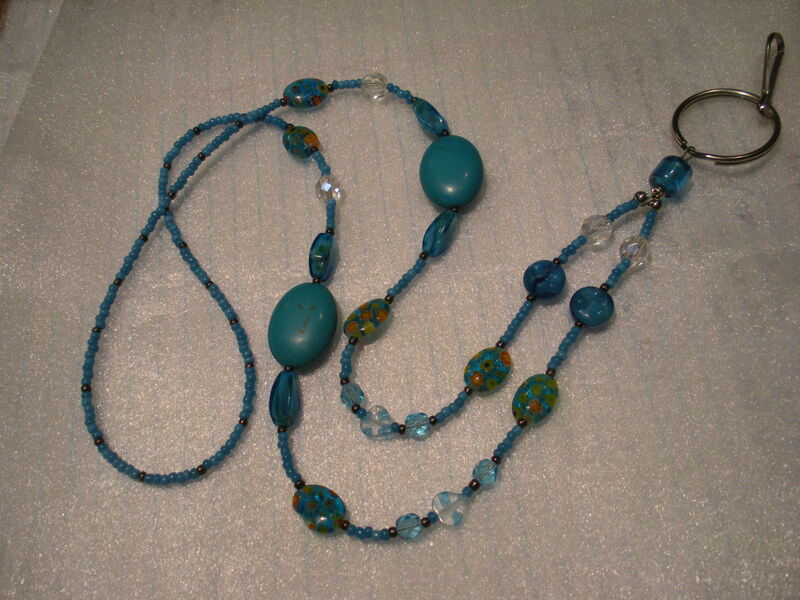 Each bead strand measures approximately 28 inches in length. I make each leash with Beadalon™ durable multi-strand beading wire, which is both strong and flexible. The 49-Strand .018 Nylon-Coated Stainless Steel beading wire ends are double crimped and covered with crimp covers. Quality ingredients help to make a long-lasting product that will be used and enjoyed. I shop carefully for my supplies in order to keep prices down (and keep my husband happy). For my first two orders, I wanted to keep the cost below what it would be for the customer to go elsewhere, and I ended up selling for less than it cost to make them… live and learn! I am now carefully going through my receipts and making a spreadsheet so that I can price my work fairly. 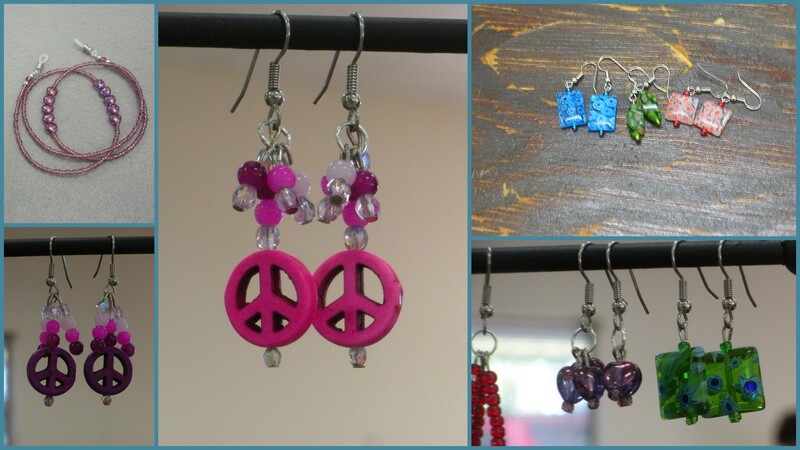 I am happy to work with you to create a special one-of-a-kind piece. 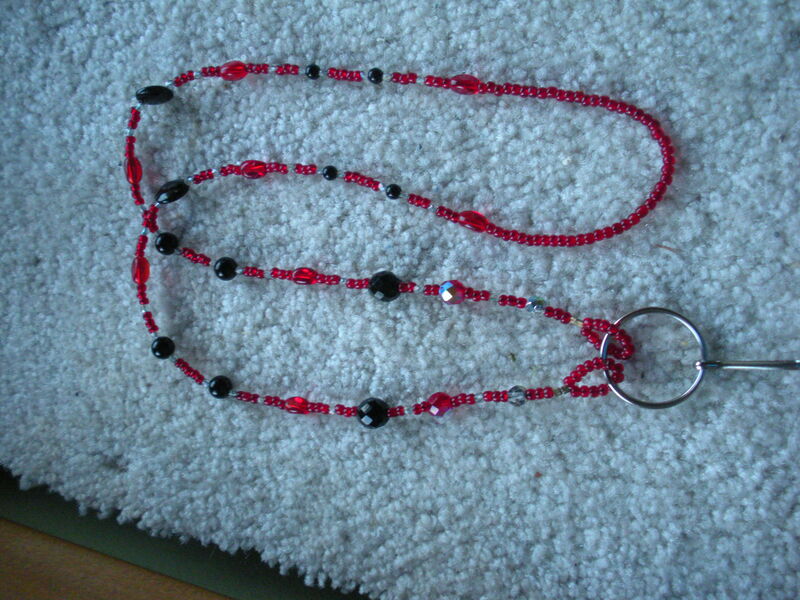 The base price for a simple eyeglass leash is $12. Costs may be higher depending upon materials used. Shipping is not included in the price. Some of my seed beads are Vintage Venetian Glass Beads (approximately 100 years old) so you just might be getting a piece of Italian history with your order! Semi-precious gemstones, Swarovski™ or Precosia™ crystals, among other special beads, will affect the price of the finished creation. Brighten up your day by wearing a specially created lanyard to display that ID badge at work! 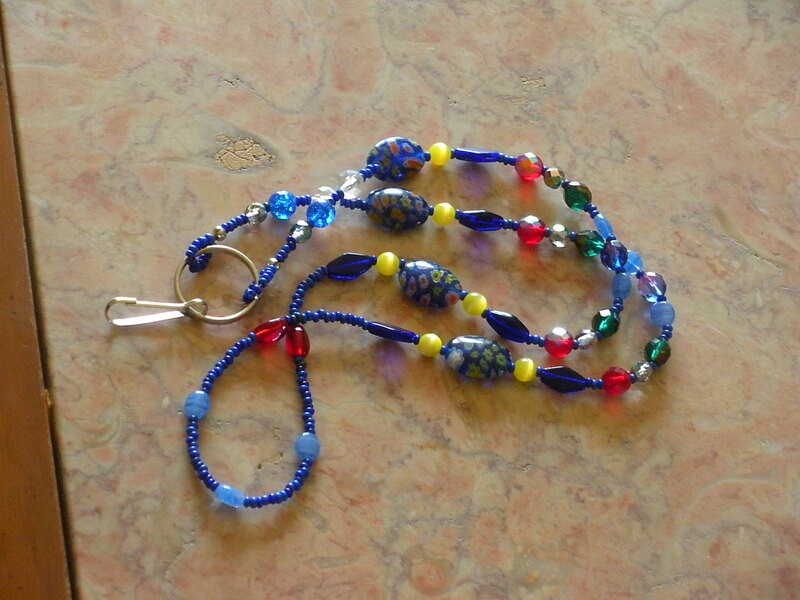 Each of my beaded lanyards measure approximately 31-34 inches in beaded length (your own height and personal preference are taken into consideration) and includes a split ring and lanyard hook. 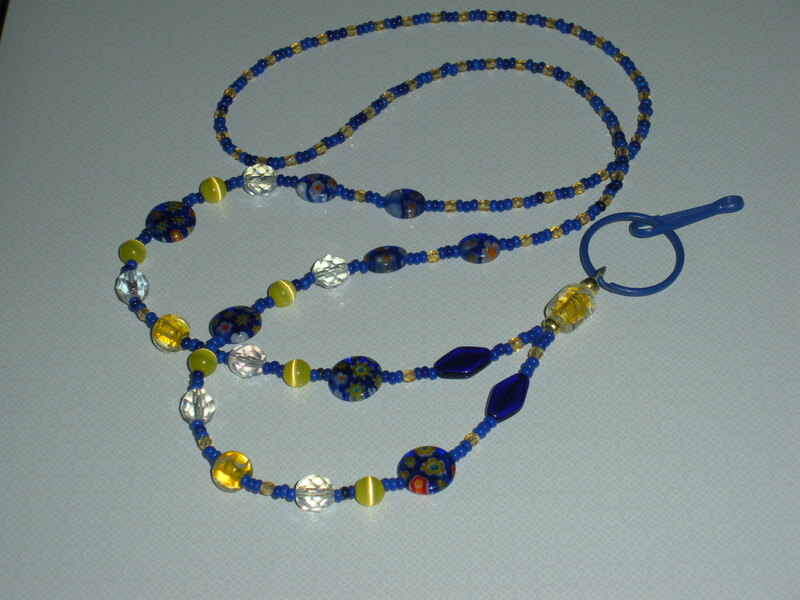 I make each Lanyard with Beadalon™ durable multi-strand beading wire, which is both strong and flexible. The 49-Strand .018 Nylon-Coated Stainless Steel beading wire ends are double crimped and covered with crimp covers. Many of my seed beads are Vintage Venetian Glass Beads (approximately 100 years old) so you just might be getting a piece of Italian history with your order! Semi-precious gemstones, Swarovski™ or Preciosa Crystals, among others, will effect the price of the finished creation. 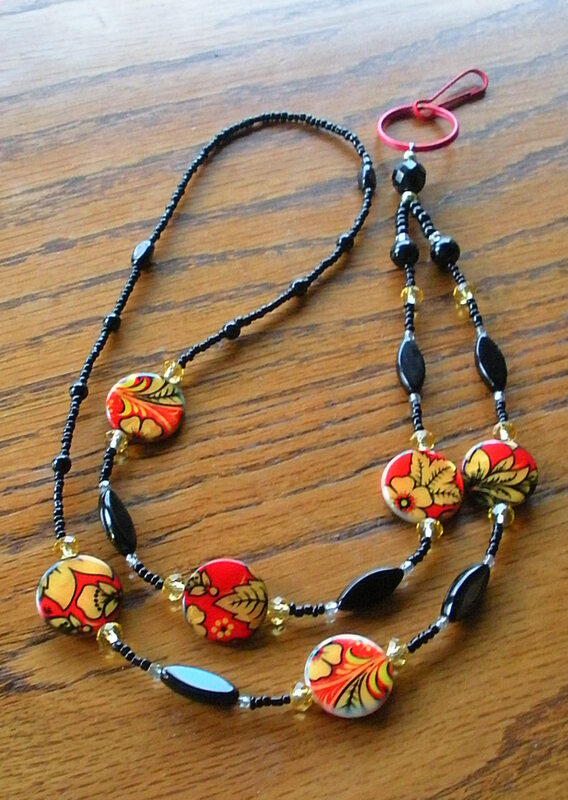 I am happy to work with you to create a special one-of-a-kind piece. The base price for a lanyard is $25. Costs may be higher depending upon materials used. Shipping is not included in the price. 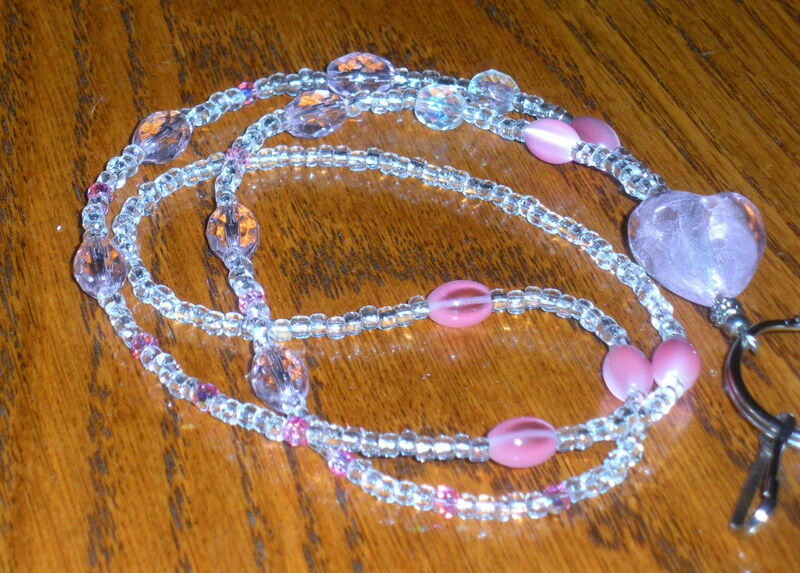 Lanyard with pink foil-lined heart, pink Swarovski crystals, clear Vintage Venetian glass seed beads, pink glass Czech beads and pink fiber optic beads.